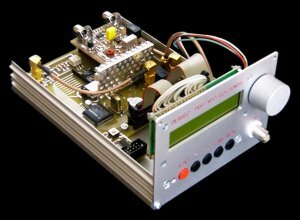 This project started in the middle of 2003, when i read some articles about DRM (Digital radio mondiale) and found the website of Christoph Petermann (DF9CY), where he published some schematics for a DRM demonstration receiver. A detailed description of the different modes of oeration can be found in the folowing sections. The DDS-VFO starts with the screen, shown in fig. 3. The backlight is turned on smoothly and a double beep sounds. If this screen appears, all the parameters are read from the EEPROM. After a delay of one second the program continues with the last saved settings or the default settings after a setup. This feature is implemented because of the missing image or mirror frequency (fr +2*IF) rejection of the receiver frontend (untuned input circuit). If a station is transmitting at this mirror frequency, the IF shift can be toggled to get a (maybe) better signal of the wanted DRM-station. In the lower line of the display, a frequency bar with the coarse frequency information is shown. • Press ENT to toggle between "LO above fr" and "LO below fr"
In the "IF Adjust" menu (see fig. 6) the IF shift can be set between 1kHz and 460kHz in steps of 1kHz with the dial. By pressing ESC the displayed IF will be applied and the screen is switched back to receiver mode. The receiving frequency can also be changed by remote from the PC (e.g. by DReaM). The device acts as a Yaesu FT-817, but only for frequency change information. A remote access is indicated by the symbol, as long as data is transferred (see fig. 7). A change of the mode, frequency, cursor position, IF shift or IF will cause the device to store the actual parameters to the EEPROM after 3 seconds of inactivity. So the write cycles to the EEPROM are reduced. The generator mode is indicated by an double sine symbol ( ). 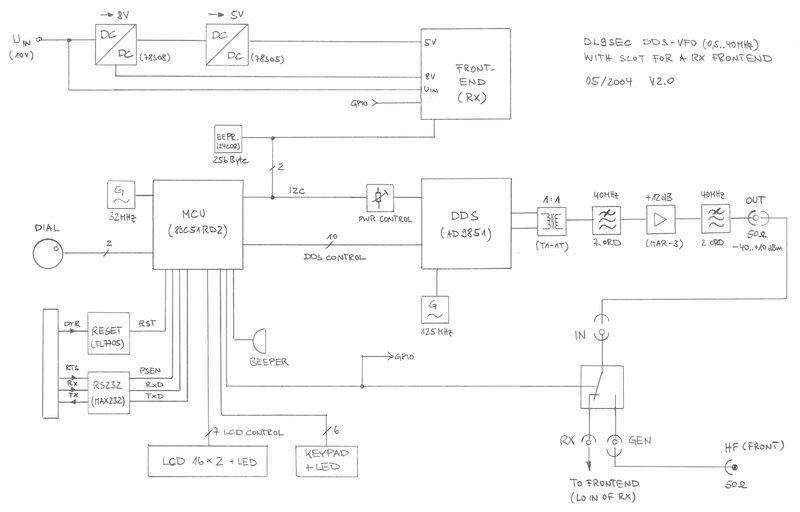 In this mode, the DDS-VFO is used as high frequency (HF) generator. The internal relay switches the HF from the internal jack "RX" to the front panel BNC jack. 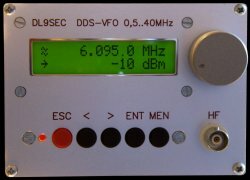 The DDS output frequency equals the displayed frequency. Instead of the frequency bar, the output power is shown. This output power can be changed with the dial in the following steps: -40dBm, -30dBm, -25dBm, -20dBm, -15dBm, -10dBm..+10dBm (in 1dB steps). The choosen power is held constant over the whole frequency range within ± 0,3dBm by a calibrated table (1MHz steps). Remote control is possible like in receiver mode (see fig. 9).